‘Tis the season for all things cozy and warm. I know just the words “Pumpkin Spice Latte” evoke an emotional (okay, Pavlovian) response from more than one of you. I’m more of a “Tall-Blonde-Half-Caf-Room-For-Cream” kind of girl myself, but apparently there’s not a specific season for that. Whatever, Starbucks. We’re snuggling up to Fall these days and I for one couldn’t be more ready. Drag out the blankets for the sofa and my tall boots that have been in storage and I’m one happy girl. It’s my Northeastern upbringing that started my love affair with fall and it was my years at Cornell that solidified it. You haven’t lived till you’ve been in Ithaca, NY in the fall. A-ma-zing. The curious thing about Fall is that we all seem to love it even though it signifies change in such visible ways – I mean, it’s basically shouting “WINTER IS COMING! IT’S GOING TO BE COLD. AND DARK. FOR MONTHS.” from its orange and red treetops, and yet we’re still happy! Maybe we’re distracted by the spectacular leaves or the crisp cool air or all those pumpkin spice lattes, but it’s one of the few times in which we readily embrace change instead of resisting it. Normally, we’d rather remain miserable than do the work required to change something in our lives, because the process of change seems so arduous. Intentional change plays out across five stages and they’re not all difficult. In fact, three out of five can even be fun. Let’s say, as an example, that you decide to start writing in a journal every day. Here’s how it might unfold across the five stages of change. 4) Momentum – You begin to pick up speed when those same, not-so-new-anymore behaviors become more automatic and start to require less effort. You’ll feel things like this. “Wow, I wrote for 20 minutes today without even noticing! I could write about this thing that just happened at the soccer game. That conversation I just had feels like something I should write about. How long it takes for these five stages to play out varies based on how big the change is and how much of your focus it can muster, but the stages are always there. Did you notice that one of the most difficult moments was deciding to make the change – fighting off all the internal dialog telling you that you can’t or shouldn’t? And did you notice that as soon as you do decide, your inner critic morphs into your inner cheerleader before your very eyes? It’s that cheerleader who you need on your side through the uphill battle until you create your own momentum and settle into a new normal. Getting her in gear is EVERYTHING. If the voice in your head these days sounds more like the inner critic heading up the Resistance, let’s try this. 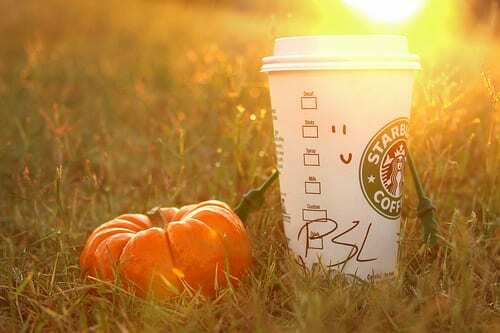 Go get yourself a Pumpkin Spice Latte and see if you can quiet her down. Let her know this is the day you’re beginning anew. And then let the exhilaration kick in. It’s Fall. Change is in the air.